Panang neur, otherwise known in English as Panang curry beef, is a fairly dry coconut milk curry that is named after the city of Panang, which borders southern Thailand and Malaysia. The chile paste is often thickened with peanuts, so those with a peanut allergy should avoid this dish; for others, the flavor is indescribably good. Panang is a fairly mild curry when served in most restaurants; however, it can be made as hot as the cook and diners would like through the addition of more chiles when the curry itself is cooked. One ingredient that is necessary to this dish, which of course, I did not -have- when I cooked it on the 4th, are kaffir lime leaves. These are the leaves of the kaffir lime tree, and they are redolent of citrusy-floral fragrance, and when shredded, add an indescribable flavor to the curry. I thought I had a few of them frozen yet left; however, when I looked for them, they were not in evidence; I then remembered cooking the last of them in a tuna dish months ago. Since I had already started making the curry paste, I went on without the leaves, but the finished dish, while quite flavorful, was nowhere nearly as fragrant and rich without the scent of kaffir lime. If you, like me, cannot find the kaffir lime leaves in your town, do not despair, and do not use the dried leaves instead. They have little flavor left in them. Instead, order fresh leaves from Thaigrocer.com. I have ordered fresh lime leaves, galangal, lemongrass, and bird chiles from them many times and have never, ever been disappointed. When I absolutely cannot get to Columbus to buy my Thai fresh herbs in person, I order from this place, and they always send the best produce imaginable. 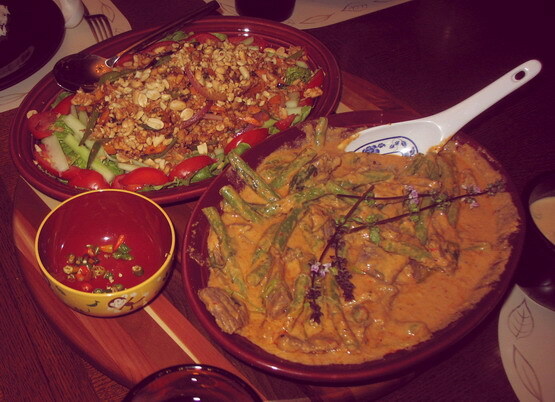 Siam Square is where my palate was trained in Thai food. The chef, a woman, used to peek through her kitchen window to watch me eat, to see if the food she had made for me was too hot–because I kept insisting to the waiter, who had come to know us, that I really could take the heat. Slowly, over time, she just started ratcheting up the heat, and the other flavorings in my food, to the point where the waiter finally told me I was eating like a Thai person. She made panang curry with beef and green beans, so that is what I put in mine. Her curry paste included a bit of cardamom seeds, in addition to white peppercorns, so mine does too. (Though you will note that I eschew white peppercorns in this recipe and instead used grains of paradise, so as to keep my allergy to pepper in check.) She also colored her paste with dried chiles colorado–because as the waiter told me, they added color but no heat. If you don’t want to make your own curry paste–though of course, I think you should–use Mae Ploy brand, and add a bit of ground white peppercorns, cardamom and peanuts to it. It will give the curry a much fresher flavor that more closely replicates my beloved chef’s way of making this dish. Using either a mortar and pestle, pound the ingredients into a paste, in the orer in which they are written. Put half the coconut cream into a wide, heavy skillet and heat until it is simmering. 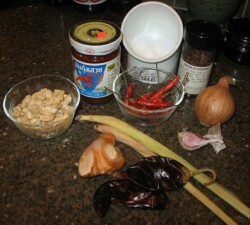 Add curry paste, and stir, cooking until it is quite flavorful. Add the rest of the coconut cream, lower heat and bring to a simmer. stir in meat, then season with fish sauce and sugar, and cook, stirring until mixture comes back to a boil. Lower heat again until the dish cooks at a bare simmer. Add half the shredded lime leaves. Allow curry sauce to reduce until it thickly coats the meat, and cook until the meat is done through, and is tender. Add the green beans, stir to coat. Garnish with remaining lime leaves and the chile slices, and serve with steamed jasmine rice. Note: In the first photograph above, the other dish presented with the Panang Neur is Nam Sod, a Thai minced chicken salad. Hi Barbara – Sorry I haven’t commented very much recently….but so much of what you write…is “write on”. I’ve found that Kaffir Lime leaves do well when frozen, as you noted. And as you stated, there is nothing quite like the flavor of Kaffir Lime leaves – I’ve found that dried versions leave much to be desired. Thanks for the tip about Thaigrocer.com. I’m lucky to have a step-sister who sends me the lime leaves (which I keep in the freezer too!) but I can’t find galangal anywhere around here. Will promptly order some! What’s kosher salt? I’ve seen this mentioned before, but have no idea what it is. Is it just available in the USA, or could I get it here in the UK? not to step on anyone’s toes: kosher salt, I imagine, is widely available. It’s a larger salt crystal so you get less salinity per density of crystals. Used for the eponymous koshering process, but it’s also a common kitchen product. We’ve had a thread on a local board going for a couple of years on growing your own kaffir lime plants…supposedly, they take quite awhile to “bloom,” but the pics I’ve seen are really quite lovely. Tons of shiny, twinned, green leaves. You just know they smell incredible. I’m not certain if anyone’s had luck with the actual fruits, tho’. Hey, Kirk! That’s okay–I have been quiet at your place, too! I just ordered supplies Kalyn, and will post about them when they come in. If it is around weekend herb blogging time, I will make a post of it! Stephanie–Chris got your question answered for you! Oh, Chris–I am not good at growing things indoors all the time. I sometimes do something dumb and forget to close the window in the sun room when the first frost comes (which killed the huge begonias we had managed to keep for three years) or to water them, or worse, I water too much and drown the poor things. I am much better at outdoor gardening where Mother Nature helps me out! Hello, Wywy–I have seen penang spelled as panang, and vice versa. I think that the city is Penang, and the curry is either Penang or Panang (I have bunches of Thai cookbooks, and the spelling for the curry is split pretty equally between the “e” spelling and the “a” spelling. The “a” spelling was the first one I learned so I tend to use it the most. Thanks for pointing out to me that the city was spelled wrong. I hope you keep coming back and reading! Hi. I was wondering, how do you make curry thicker? Mine tends to come out rather liquid-y. Brian, the way that panang nuer gets thick is by using less coconut milk than other types of Thai curries, and by reducing the amount of water in the recipe by simmering the water away. Reduction is the best way to make Thai or Indian curries thick–just simmer the curry on low heat until the sauce thickens and concentrates in flavor to the level you like. You can add a thickener like a water-flour or water-cornstarch slurry, but I don’t like doing that myself.